Brand new in our showroom ready to take away !! Offer Price includes: complete unit stand, table top, motor + instructions and manufacturers accessories. Can be collected from our Manchester showroom and national delivery is available at cost price. 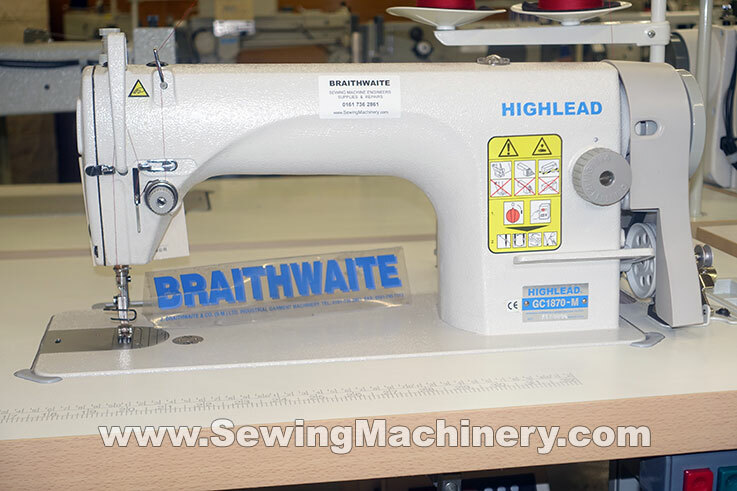 Highlead GC1870-M general purpose high speed industrial sewing machine for use on light to medium weight fabrics. This versatile Highlead model, with its standardised robust design, is in use around the world and known for its easy operation and minimal maintenance requirements. Smooth running, with automatic lubrication, it can be used to stitch many kinds of articles such as garments, sheets, dresses, cushions, upholstery or other items constructed of light to medium weight fabrics. It is also a welcome addition to any busy dry cleaners or alteration shop. The optimized engineering relationship between the thread take up, sewing hook and feeding assembly allows for low thread tension sewing, which is true and even, producing a well-balanced stich formation on a wide range of materials. Many optional accessories are available for the Highlead GC1870-M, including: zip feet, piping feet, gathering feet, hemmers, binders and guides etc. A Low voltage needle light kit is also available. Supplied complete on full sized work stand with industrial sewing machine motor (standard UK 13amp plug) and 12 months manufacturers UK warranty.